This article is about the mountain range. For the asteroid named after them, see 10248 Fichtelgebirge. The first person to write about the Fichtel Mountains, Matthias of Kemnath (actually Matthias Widmann, b 23 February 1429 in Kemnath) reported in 1476: Ein bergk, hoch, weitt, wolbekant ligt in Beiern, gnant der Fichtelberg ("A mountain, high, wide and well-known, lies in Bavaria, known as the Fichtelberg"). In descriptions of the border in 1499 and 1536, the mountain that is now called the Ochsenkopf was called Vichtelberg; thereafter the name was extended to the whole mountain region. It is also mentioned in old documents: around 1317 the lords of Hirschberg were enfeoffed inter alia with the walt zu dem Vythenberge. By the 14th century iron ore was being extracted in the St. Veith Pit on the southern foot of the mountain. Vyth → Veit → Fichtel. High-profile local history and name researchers have still not had the last word. Together with the Thuringian Forest, Thuringian Highland and Franconian Forest the Fichtel forms a major natural region called the Thuringian-Franconian Highlands (no. D48 and 39). 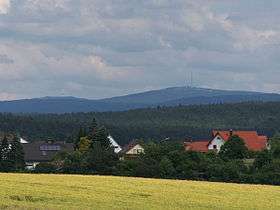 The Fichtel Mountains lie between the towns of Hof and Weiden. In the west there is a good transport link to the nearby city of Bayreuth, whilst in the east, in the Egerland (capital: Eger, Czech: Cheb), communication is still very limited, a legacy of the Iron Curtain. The Hof–Weiden autobahn provides a good north-south link, however. 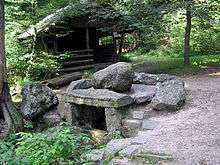 The county town in the heart of the Fichtel is Wunsiedel with its famous rock labyrinth. 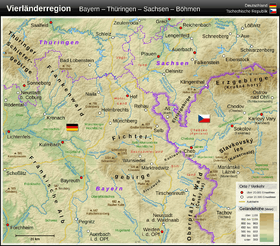 Other main settlements are Marktredwitz, Marktleuthen, Arzberg, Röslau, Weißenstadt, Waldershof, Kirchenlamitz and Tröstau (all on the upper reaches of the Eger and the Röslau), Further to the southeast and south are Bischofsgrün, Fichtelberg, Mehlmeisel, Nagel, Neusorg, Speichersdorf, Kemnath, Erbendorf, Wiesau and Fuchsmühl, in the west are Weidenberg, Creußen, Bayreuth, Goldkronach, Bindlach and Bad Berneck, in the northwest are Gefrees, Zell im Fichtelgebirge, Weißdorf, Münchberg (Obere Saale), and in the north Selb, Rehau and Hof. The boundary between the (East) Franconian dialect in the north and west and the (North) Bavarian and Upper Palatine dialects in the east and south runs diagonally through the Fichtel from northeast to southwest. This language border does not coincide with the administrative boundary of Upper Franconia and the Upper Palatinate, but, for example, Bavarian is also spoken in the Upper Franconian district of Wunsiedel. 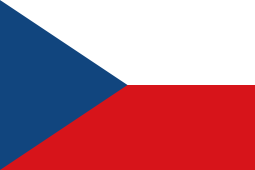 Moreover, there are descendants of those who, after the Second World War came from Bohemia, Moravia, Silesia and East Prussia into the Fichtel Mountains, and who make up a significant percentage of the population. The highest mountain in the Fichtel is the Schneeberg at 1,053 metres (3,455 ft). 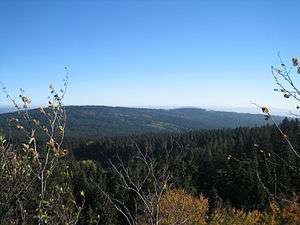 Other major summits are the Ochsenkopf (1,024 m), the Steinwald (Platte 946 m), the Kösseine (939 m), the Großer Waldstein (877 m) and the Großer Kornberg (827 m). To the northeast the Fichtel transitions into the Elster Mountains and the Ore Mountains, to the southeast is the Upper Palatine Forest, the Bohemian Forest and the Bavarian Forest. To the northwest is a clear geological divide with the Franconian and Thuringian Forests. To the southwest it descends to the morphologically very different Franconian fault-block landscape. 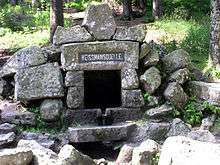 Numerous moors and marshes, which are now protected, are valuable water collectors. The European watershed from the North Sea to the Black Sea runs over these mountains. The highest mountain is the Schneeberg at 1,051 metres (3,448 ft). Rivers rising from the Fichtelgebirge are the White Main (German: Weißer Main), the Saxon Saale, the Ohře (German: Eger) and the Fichtelnaab which later joins the Waldnaab. 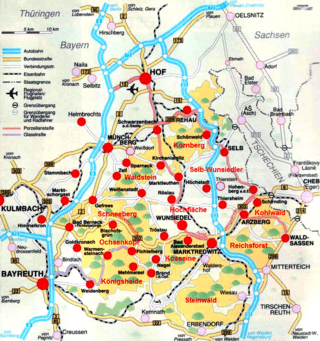 Major towns on the edge of the mountain region are Bayreuth and Hof. While the mountains dip gradually away to the north and the south, they form a steep slope in the west where the Red Main forms the boundary of the mountains. The Ochsenkopf ("Ox Head") is the second highest mountain of the Fichtel range, at 1,024 metres (3,360 ft). There are two chair-lifts to the summit, one from Bischofsgrün in the north and one from Fleckl in the south. The "Asenturm" (Æsir Tower) is an observation tower on the summit with a restaurant attached. Geologically the Fichtel massif consists mainly of granite. The history of its orogeny begins in the Precambrian Eon about 750–800 million years ago. From that time only the truncated uplands of the once-towering mountain chain are left. Subsequently the area was covered by sea, and rivers transported sediments from the old eroding mountains on the coast. These sediments were deposited as layers of clay, sand and limestone. At the beginning of the Cambrian Period, about 570 million years ago, these beds were folded and raised up to form new mountains. High temperatures and pressure during this mountain folding process, which lasted into the Upper Carboniferous Period, created metamorphic rock. The shale layers were transformed into phyllites and schists, sandstones metamorphosed into quartzite and limestone produced Wunsiedel marble. These mountains, which may have been several kilometres high, were also eroded to sea level again. In the next phase, great, deep-sea sediments were laid down under the present-day Fichtel Mountains and the Franconian Forest from the Silurian, Devonian and Lower Carboniferous periods; these are especially well recorded in the Franconian Forest, whose rocks were only subject to very low-grade metamorphism (associated with volcanism and ore formation) and which contain easily dated fossils. Finally, in the Upper Carboniferous period 285 million years ago, the Hercynian mountain building phase began and raised the Fichtel Mountains, Franconian Forest and Münchberg gneiss plateau into high mountains – like almost all the fold mountains formed during the Hercynian period. This mountain building episode was the Variscan orogeny, named after Hof's Latin name (and the tribe of Varisci) of Curia variscorum. At the same time, magma intruded in several phases into the folds, where it solidified under the Earth's surface into the present-day granites. As granite formed, secondary rocks were only affected by slight contact metamorphism. The rest of the molten rock with its ore-containing fluids formed pegmatite, as well as veins of ore and minerals – the basis of the medieval mining industry and early industrialisation of this region. During the Upper Carboniferous and Lower Permian (Rotliegendes) large quantities of rock debris were deposited in intramontane basins and onto the foreland of the mountain range. These basins were formed by extensional tectonics which were accompanied by an intermediate to acidic volcanism. The sediments of the Rotliegendes are only exposed in a few places, but have been confirmed across a wide area by drilling beneath the platform southwest of the Franconian Line. Late Variscan volcanic rocks occur in the Fichtel Mountains as layers of rhyolite. In the neogene (Upper Tertiary beginning 26 million years ago) period, tectonic activity increased again – just as the Alpine orogeny (Alps, Carpathians etc.) slowly came to an end. In that time, parts of this and other older massifs (such as the Bohemian-Moravian Highlands or Bohemian Massif in the Alpine foothills) sometimes ended up underneath younger rock. In the Upper Miocene (10 million years ago), molten basalt broke through in northern Upper Palatinate as the Eger Graben was being formed. Through erosion, the remains of former diatremes have been uncovered and may be seen e.g. on the Rauher Kulm or at Parkstein near Weiden. Basaltic surface layers, i.e. extensive flows of low-viscosity lava, are visible e. g. on the Teichelberg near Pechbrunn. These basaltic nappes should not however be confusd with the formation of tectonic layers. The formation of the present landscape finally took place in the younger Pliocene about 5 million years ago: an earlier-formed Franconian fault line came under pressure again and the Fichtel Mountains, Franconian Forest, the Münchberg Gneiss Massif and the northern Upper Palatine Forest were uplifted along it. This last uplift gave the forces of erosion more to do again and the rivers cut deeply into the already, almost levelled, mountain range. So the present day structure was created from a plateau: a low mountain range which is being gnawed away at on all sides, with a long and varied history. Although often difficult to interpret, it is an 'Eldorado' for geologists from a wide range of specialisms. Granite (Latin: granum for grain) and its derivatives make up about 40% of the area – its impact being all the more striking because this very hard, yet hydrous, rock forms the highest peaks in the area. Its stark appearance and the early emergency of industry here have made their mark on landscape and people. Porphyritic Granite of the Weißenstadt/Liebenstein massif (including the towns of Marktleuthen/Röslau) and extending into the Czech Republic as far as Haslau. The porphyry contains biotite (dark mica) and phenocrysts of feldspar up to 8 cm across. Reut Granite near Gefrees is, by contrast, finer with a bluish-grey hue. Selb Granite (found northeast of the upper massif near Schwarzenhammer and running through the Selb Forest and the Czech Republic into Saxony/ Elster Mountains) is fine-grained, but grey again. Holzmühl Granite occurs in just two small outcrops near Holzmühl, 3 km southeast of Marktleuthen and near Längenau on the Wartberg, east-northeast of Selb; medium-grained with a higher biotite content, unevenly grained microstructure. Redwitzite is also called Syenite Granite and occurs in the Marktredwitz/Arzberg/Thiersheim triangle; medium- and also fine-grained, its variable mineral composition produces colourations from light grey, dark grey and dark green-grey to almost black. Kösseine-Rand Granite occurs on the Kösseine, including the Burgstein, Haberstein and Schauerberg, and the southern part of the Großer Kornberg massif; small- to medium-grained, porphyritic structure weak or missing; low in phenocrysts. 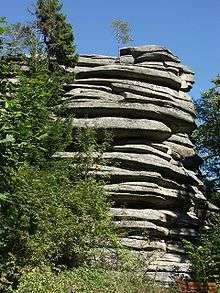 Kern Granite is found in the central Fichtelberg/Ochsenkopf/Nußhardt block and on the eastern perimeter of the Schneeberg; it forms outcrops of in the shape of numerous rock formations; medium- to coarse-grained. Kösseine and Wolfsgarten Kern Granite. There are numerous pockets of Kösseine Granite containing hornfels, cm-large biotite-rich shreds and nodules of host rock, rounded or round quartz-feldspar rich pockets on the Kösseine massif: narrow band on the north, east and southern edge, small labyrinth, Kleinwendern quarry, Hirschensprung rock formation, Wolfstein, Hohenstein, Ochsenkopf, Hundslohe and Gregnitz valley; on the Kornberg: the Wolfsgarten forest and the south-southwestern part of the Großer Kornberg; relatively coarse, has an unusual appearance due to the blue feldspar, black biotite and richly sprinkled dark foreign bodies; Wolfsgarten Granite is somewhat lighter blue. Zinn Granite is restricted to the central massif and occurs on the Rudolfstein, on the Drei Brüder almost to the summit of the Schneeberg, western slope of the Seehügel, between Seehügel and Platte, Fuchsbau and Zufurt west of Leupoldsdorf; very even, medium grain; little biotite, a lot of muscovite; lighter, brighter hue. Rand Granite of the Steinwald massif: in the western part of the Steinwald, e. g. on the Dachsfelsen, and the northwestern part of the Grandfelsen; small-grained. Steinwald Granite occurs in the centre, including the Weißenstein, Platte, Katzentrögel, Reiseneggerfelsen and Hackelstein; coarse-grained. Friedenfels Granite is the transitional facies between the Steinwald Granite and the Falkenberg Porphyritic Granite; it forms the basement of the Pechbrunn basalt region and surfaces there at various places between the basalt nappes; porphyritic structure, especially rich in feldspar phenocrysts. By the Early Middle Ages man had begun to mine in the Fichtel Mountains. The most important products were gold, tin, iron, minerals, earths and rock (basalt, brown coal, diabase, granite, silt, marble, soapstone, clay and peat). In earlier times uranium ore deposits were discovered. 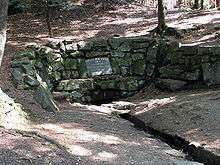 The metals were worked in hammer mills (hence the many place names ending with -hammer) on the Fichtel's rivers, in furnaces and at metalsmiths. The forests of the Fichtel Mountains supplied the wood necessary for the manufacture of charcoal. During the Thirty Years' War the mining industry became depressed and the ore deposits were largely exhausted. In the 18th century Alexander von Humboldt tried to revive the mining industry again. Many towns and villages (e. g. Wunsiedel, Weißenstadt, Arzberg, Fichtelberg-Neubau, Goldkronach) owe their emergence to the mining industry. 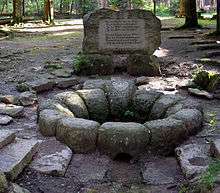 The Hugenots introduced the Easter decorations on wells, so-called Osterbrunnen, in the shape of a lily (emblem of the Bourbon kings) (as described e.g. in the April 2007 of the Fränkische Post). Although the mining industry is only of historic interest today, there are many places in the Fichtel Mountains that still produce glassware at competitive prices. The porcelain industry, centred on the town of Selb, is internationally renowned and the foremost in Germany. Local firms such as Rosenthal and Hutschenreuther are of international standing. Tourism is the main source of income for many places in the Fichtel Mountains today. In some towns such as Bischofsgrün tourism has a long tradition going back to the 1920s. After the Second World War the stream of holidaymakers increased sharply, both in summer for walking and in winter for winter sports. The Fichtel Mountains became the local mountain range (Hausgebirge) for (West-)Berliners who, unable to holiday in East Germany, were able to get there on the transit route of the A 9 motorway. This has changed since German reunification and the opening up of other mountainous holiday areas. The Fichtel Mountains are a nationally important holiday destination in winter. Several lifts, the longest being two chair lifts on the Ochsenkopf, but also a plethora of cut cross-country trails are the mainstay of this industry. The Fichtel Mountains attract many tourists throughout the year. In the winter the mountains are a common destination for people seeking outdoor recreational sports like alpine skiing, cross country skiing, and sledding. The warmer summer months find people mountain biking, hiking, and sight seeing amongst the many large rock formations. ↑ Harwood, J. (2012). Europe's Green Revolution and its Successors: The Rise and Fall of Peasant-Friendly Plant Breeding, Routledge, Abingdon and New York, p. 47. ISBN 978-0-415-59868-2. ↑ Karsten, DLG (1798). A description of the minerals in the Leskean Museum, Mercier, Dublin, p. 493. ↑ N. Hudson Moore (1906). The Collector's Manual, Butterick, Frederick A. Stokes, New York, p. 82. ↑ Schumann, Walter (2008). Minerals of the World, Sterling, New York, p. 48. ISBN 978-1-4027-5339-8. ↑ Randlesome, C. et al. (2011). Business Cultures in Europe, 2nd ed., Routledge, Abingdon and New York, p. 52. ISBN 9780750608725. Franz X. Bogner: Das Fichtelgebirge im Luftbildportrait. Ellwanger Verlag, Bayreuth 2009 (twote Auflage). ISBN 978-3-925361-68-5. Karl-Heinz Mayer: Die Forstgeschichte des Fichtelgebirges. (Dissertationsschrift.) Forstliche Forschungsberichte München, Nr. 167. Frank, München 1998, 297 (VII/XI) S.
Wikimedia Commons has media related to Fichtel Mountains. Wikisource has the text of the 1920 Encyclopedia Americana article Fichtel Mountains.